Northern Ireland's Gavin Whyte scored with the first touch of his debut appearance. Northern Ireland players prepare to face Israel. 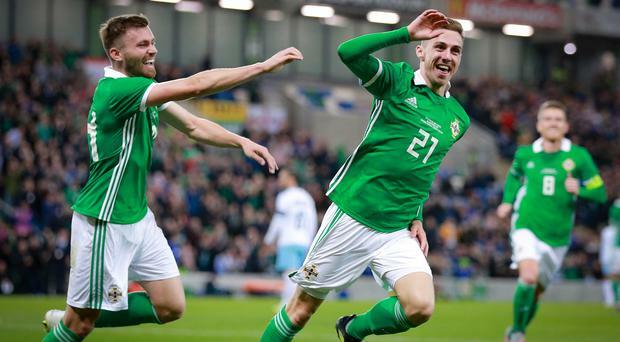 Gavin Whyte stole the show when he scored with the first touch of senior international football as Northern Ireland beat Israel 3-0 at Windsor Park. Captain Steven Davis slammed Northern Ireland into a 13th minute lead, sweeping home Paddy McNair's corner first time for his 11th Northern Ireland goal. It was two by the break, Stuart Dallas cushioning a well-struck volley into the net from a telling George Saville cross. Northern Ireland had comfortably soaked up pressure during the frist period and struck viciously on the break. NI enjoyed a more dominant second half and got their just rewards in the most joyous of fashions. Former Crusaders winger Whyte was brought on for his debut and netted within two minutes with his very first touch of the ball. Israel keeper Guy Haimov had got down to save at the feet of Conor Washington and there was Whyte, perfectly placed to slam home. The GAWA reacted by chanting his name, the culmination of a proud night for Whyte, Crusaders and all of the Irish League. Whyte only moved into full-time football this summer when he joined League One side Oxford United. Northern Ireland U21s, meanwhile, recorded an historic victory over a Spain side littered with La Liga stars.